Where has this pot roast been all my life? 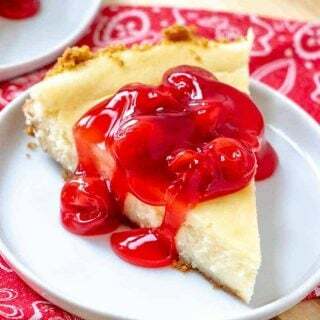 I had a bunch of folks over on The Country Cook Facebook page telling me that I just had to try this recipe. And y’all were not kidding! Holy cow this was amazingly tender and flavorful. 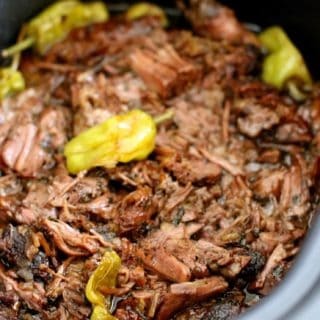 I think I am a huge fan of Mississippi Pot Roast! Note to add: I have since made a CROCK POT MISSISSIPPI POT ROAST and CROCK POT MISSISSIPPI CHICKEN! 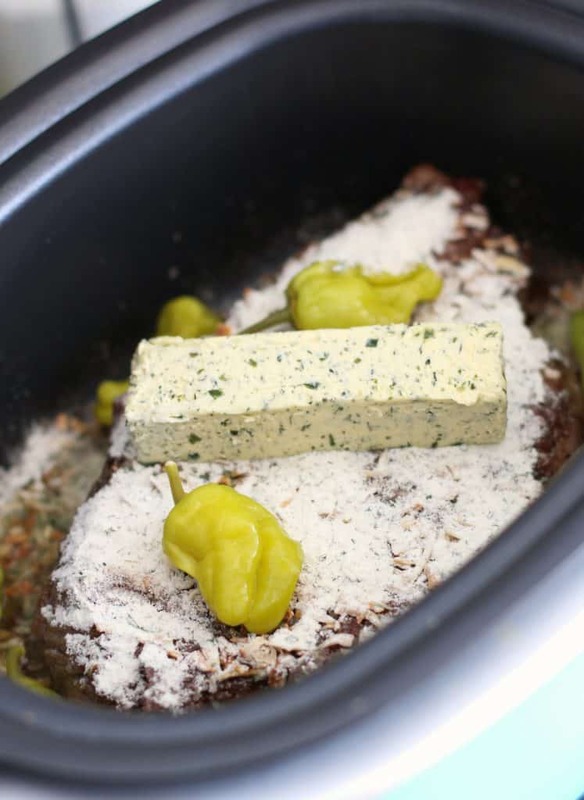 IS MISSISSIPPI POT ROAST LOW CARB/KETO-FRIENDLY? You can serve the meat by itself, over mashed potatoes or rice. 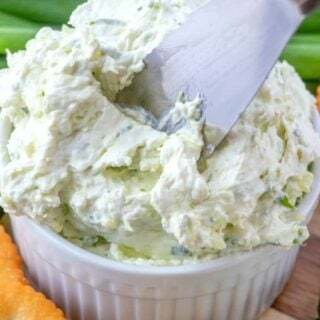 One reader suggested that it is delicious on hard rolls with melted provolone or mozzarella cheese. I can tell you, we had a small amount leftover so I ate it on a sub roll the following day for lunch with a slice of mozzarella cheese on top and some sliced peperonicini peppers and it was heavenly! 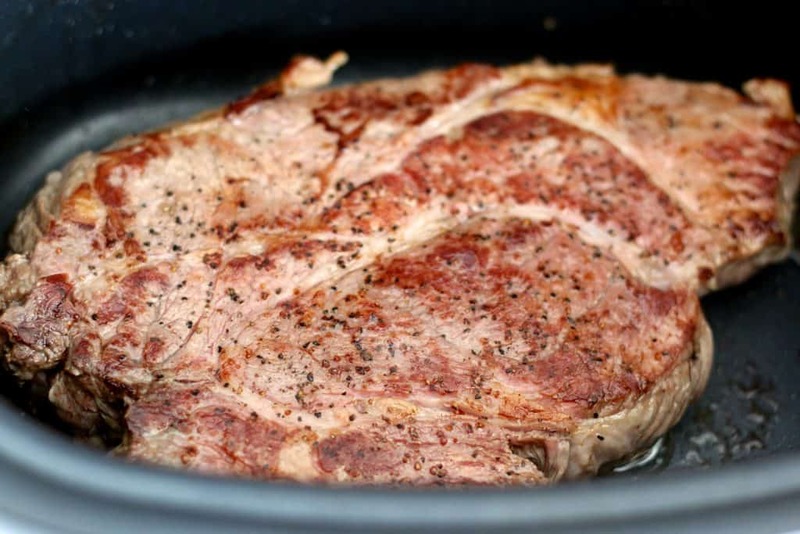 The meat comes out so tender and buttery by cooking it low and slow in the crock pot. And the flavors are not overwhelming. They really complement the beef just enough. 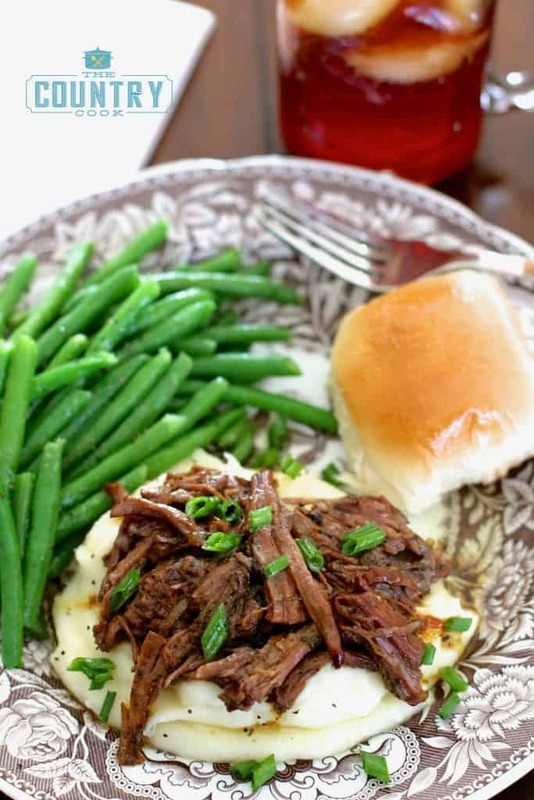 WHAT DO YOU SERVE WITH MISSISSIPPI POT ROAST? 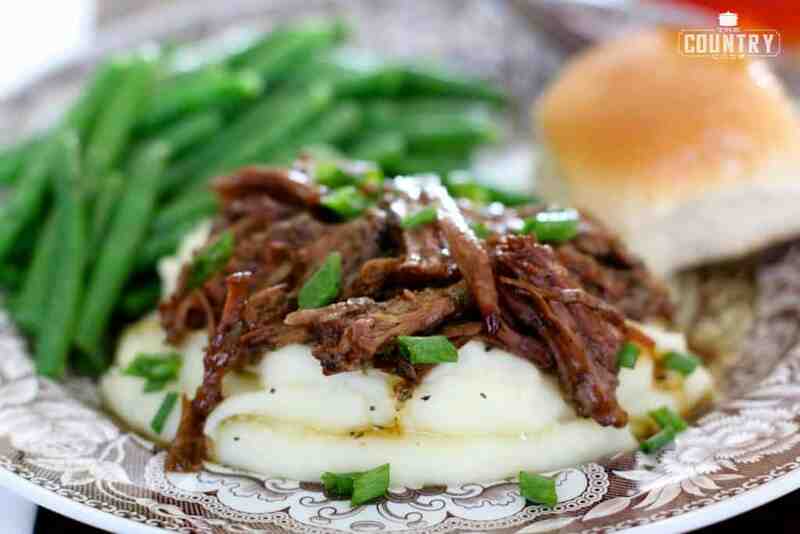 I love Mississippi Pot Roast served with my Crock Pot Million Dollar Mashed Potatoes. The flavors go perfectly with each other. Or, if you’d like to try an Instant Pot recipe, then definitely make my Crock Pot Garlic Mashed Potatoes. And you gotta have some Butter Dip Biscuits! Heat up a large skillet on high. Add oil to hot skillet. You want it really hot here to brown or “sear” the beef quickly. 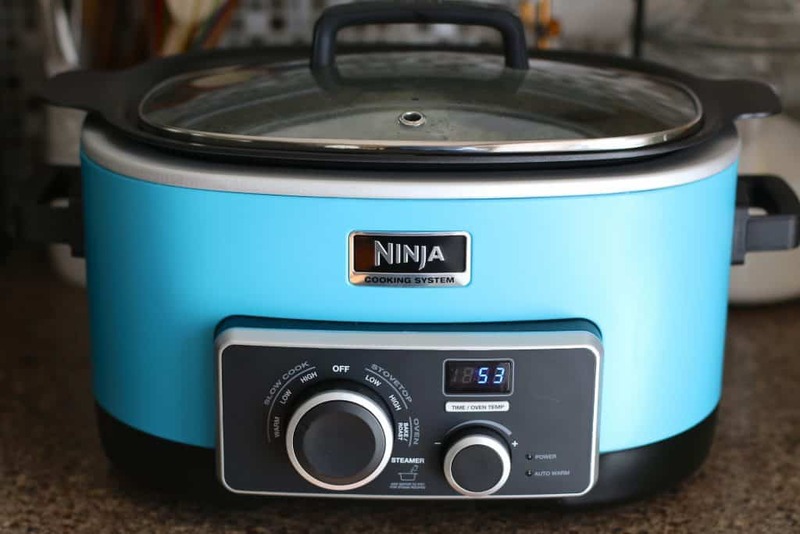 Note: I have one of those nifty new Ninja slow cookers that has a “stovetop” option, which means I can brown the meat all right in my crock pot and not dirty up any other dishes. However, if you are in a rush, just skip the browning step altogether. Take a paper towel and make sure you dry both sides of the pot roast (drying the meat helps it brown easier.) Then season with a little bit of salt and pepper. Once the skillet is nice and hot, add the roast. Allow the roast to cook for about 2-3 minutes until it is golden brown. The browning of the outside of the meat just adds flavor. Using tongs, flip the meat over and sear the other side of the roast for another 2-3 minutes. 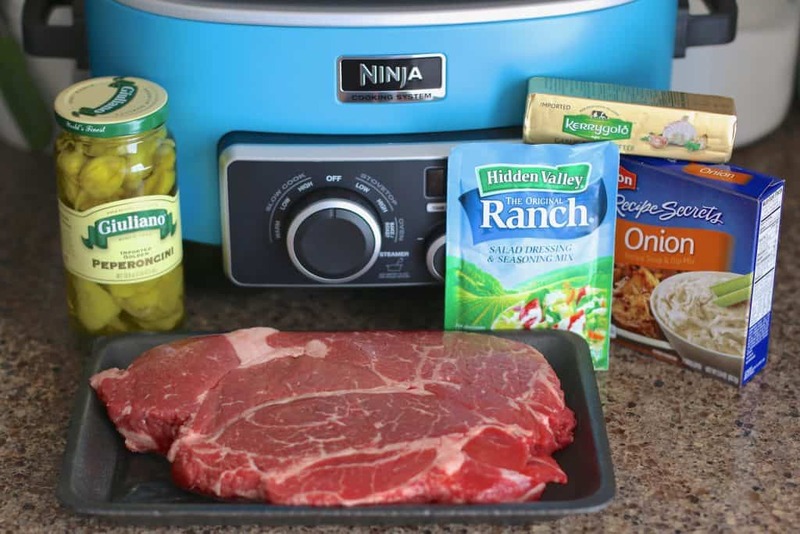 Transfer meat to slow cooker. Sprinkle packets of dry ranch dressing and onion soup mixes over pot roast. Top with a stick of butter. Then place peppers on and around roast. Note: This butter is a Kerrygold garlic & herb butter. The sticks were on sale at Kroger so I had picked up a bunch. That was the first time I had ever seen the butter in sticks. I absolutely LOVE Kerrygold butter. Irish butter just can’t be beat in terms of flavor. Must be that yummy Irish grass. But a regular ole stick of salted butter (not margarine) will still work perfectly in this. Cover and cook on low for 8 hours. You don’t add any other liquid to this. The meat will create it’s own juices at it cooks. Just cover and let it do its’ thing. And voila! It smells AMAZING as it cooks and it looks heavenly! Now all you need to do is take two forks and start shredding the meat. Discard any big fatty pieces. If you want, you can cut up the peppers and stir those into the meat mixture. I ate mine with the peppers but didn’t cut them up into the meat to serve. Serve on mashed potatoes, rice or on a roll with a slice of provolone or mozzarella cheese. Cook’s Notes: If you are sensitive to sodium, you could use unsalted butter for this. Be sure to use butter and not margarine. Margarine is basically oil. We did not find this recipe salty at all if you use this exact recipe but be sure to adjust to your preferences. 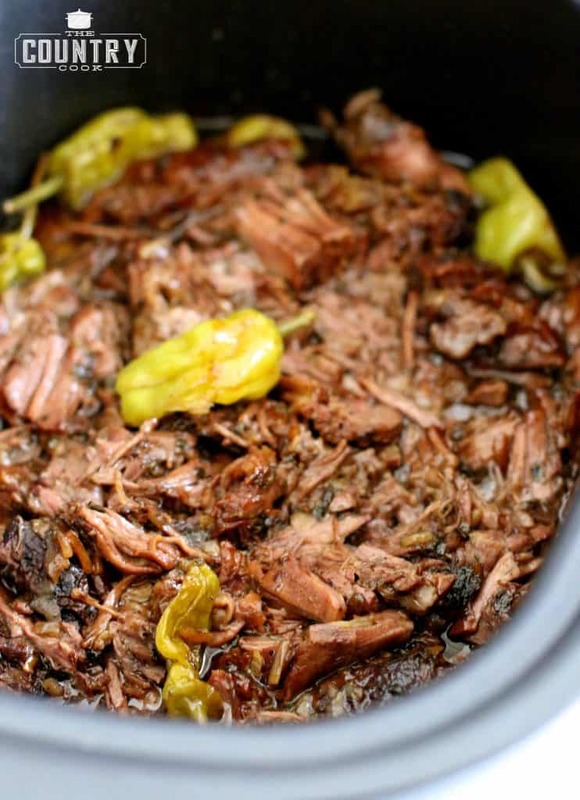 Crock Pot Mississippi Pot Roast is slow cooker goodness! 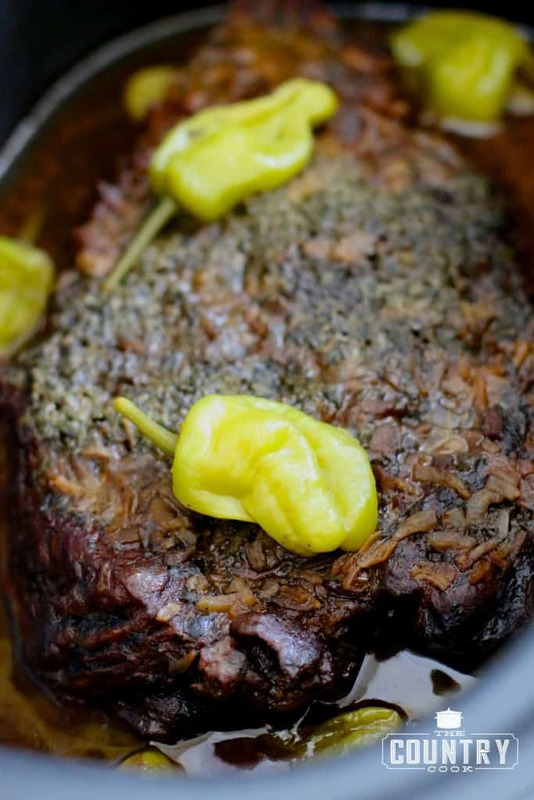 Chuck roast combined with ranch dressing mix, onion soup mix, butter and peperoncini peppers. Heat up a large skillet on high. 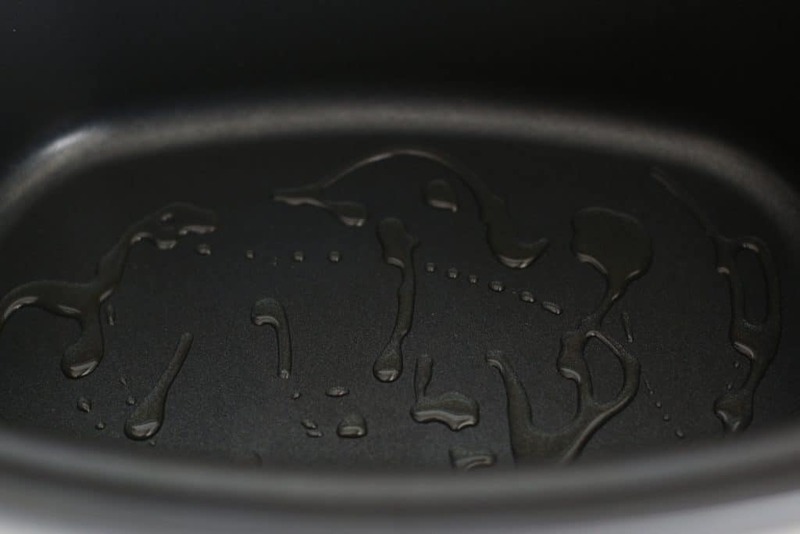 Add oil to hot skillet. 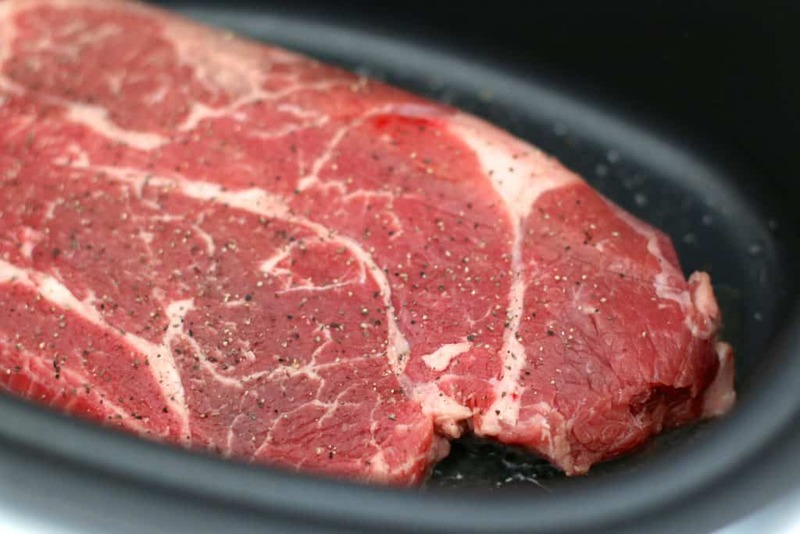 You want it really hot here to brown or "sear" the beef quickly. Take a paper towel and make sure you dry both sides of the pot roast. Season with a little bit of salt and pepper. Once the skillet is nice and hot, add the roast. Allow the roast to cook for about 2-3 minutes until it is golden brown. Using tongs, flip the meat over and sear the other side of the roast for another 2-3 minutes. 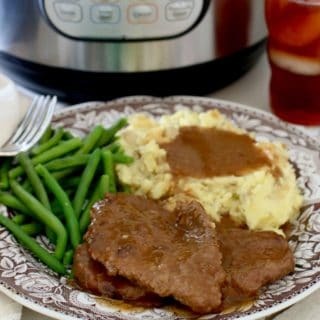 Transfer meat to slow cooker. Sprinkle packets of dry ranch dressing and onion soup mixes over pot roast. Top with a stick of butter then place peppers on and around roast. Take two forks and start shredding the meat. Discard any big fatty pieces. You can skip the browning step if you are in a rush, or just don’t feel like it. If you prefer, you can cut up the peppers and stir those into the meat mixture for an extra kick of flavor. 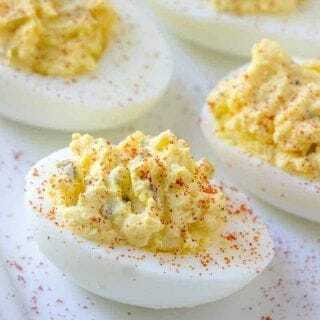 Want to make your own seasonings for this? Try these! My entire, picky family LOVED this roast. The recipe was easy to follow and delicious. I added celery, carrots for garnishments and and a packet of Mccormick’s gravy mix/ture for more gravy. Lakeisha – love, love hearing this!! I also love the addition of the gravy packet and celery & carrots. Sounds delicious!! So easy to fix and soooo good!! I’ve prepared this several times. Everyone love this dish. The only change I make is doubling up on the pepperchinis. The juices also make a fantastic gravy. Love hearing that Joe! Thanks for taking the time to come back and review! I didn’t salt when searing. Salted Irish butter took care of that. Thank you for the awesome recipe! Love, love hearing that Brian! I appreciate you taking the time to come back and comment on it! I want to make this! Just waiting on getting a bigger crockpot! How would you use chicken for this recipe? 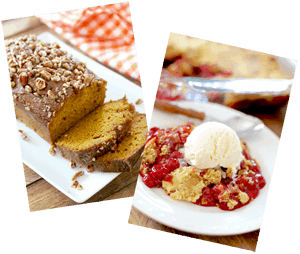 Brandie, I have this recipe from a person my daughter works with. The only difference is no onion soup mix. The flavor is wonderful and when I serve it the first time, it is with mashed potatoes. After that, we use the leftovers as sandwiches on some nice rolls. 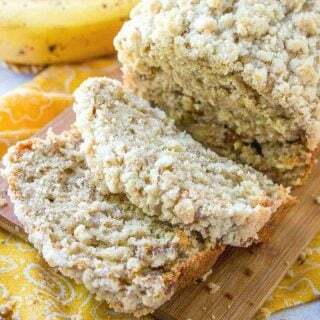 It is great with either and I love the simplicity of the recipe. I also made your Lazy Bars a week ago. I took them as a treat for my co-workers (we are election judges). Everyone loved them as usual, and the leftover bars went home with a teacher who was giving them to her special needs high school class!!! They always turn out great!!! 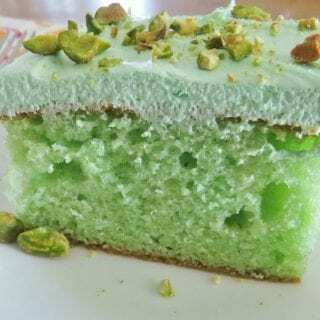 Thanks for all the recipes, I have made many of them!!!!! Keep them coming!! Brandie, I also use the Au Jus in place of the onion soup, other than that the recipe is identical. Love your site!! This is so good! 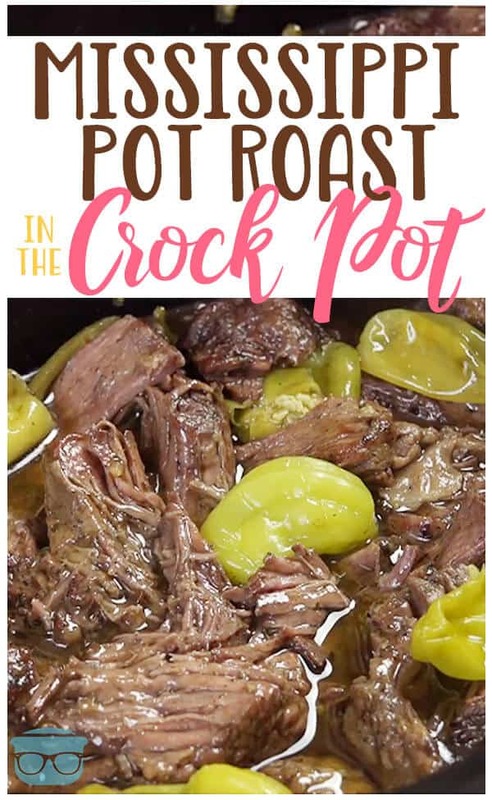 It’s the only way that I cook a pot roast now. I have changed a couple things though. I use a rump roast and 1/4 cup of butter and I slice the meat rather than shred it. It does not turn out overly salty even with the dressing and soup mixes. I added cut up potatoes that I coated with a little olive oil and it all cooked together. So easy! Love how you made it your own Bonnie!! Great suggestions! This is one of my favorite recipes of all time. I add more pepperoncini, large cut onion, and fresh mushrooms just because I love them. I have decided this is going to become one of my go to recipes for company. Every one that eats it loves it.